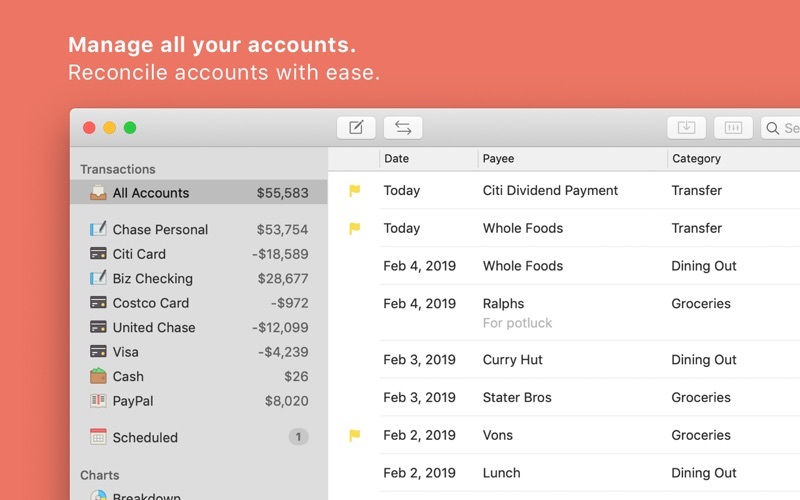 Savings lets you keep all of your accounts in one place. Not only do you stay organized this way, you can also know overall balance of your accounts at all time. Entering a transaction in Savings takes only seconds. Savings automatically fills payee and category based on past entries. So all you really need to enter is the amount. Look up past transaction instantly. Just type anything you remember into the search field and see the transactions appear instantly. 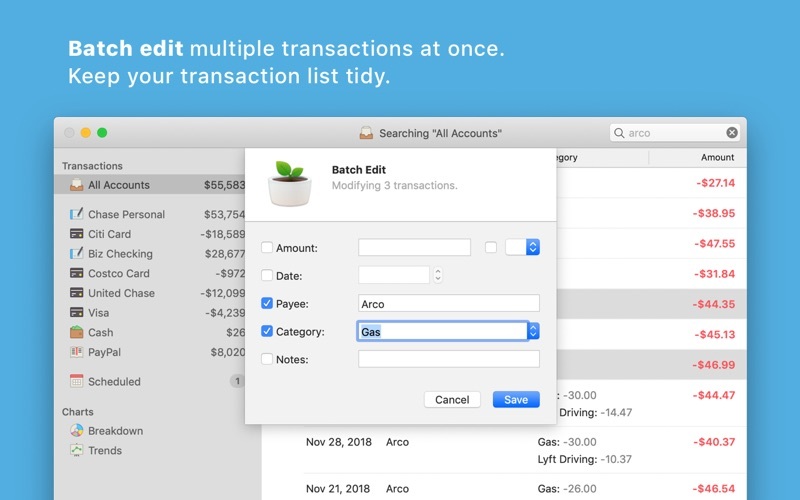 Select multiple transactions and hit “return” to edit multiple transactions at once. This is handy when you want to clean up your transactions list. When you import data from your bank, using either OFX, CSV or QIF file format, the imported transactions are automatically matched to pending transactions you have entered manually. This makes reconciling your account a breeze. There no need for complicated reconciliation screen. Already used another finance app like Quicken™ or Microsoft Money™? Savings can import all that data in using the QIF or CSV format, so you can keep your account history. 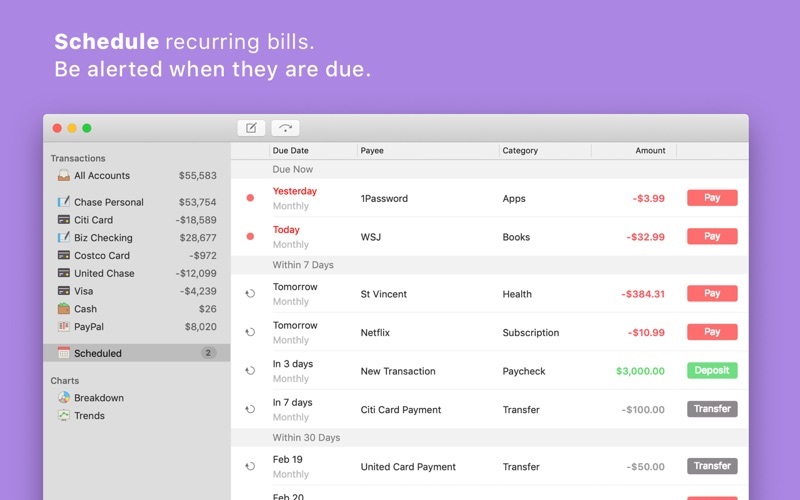 Track recurring bills and payments with scheduled transactions. You can set a reminder so you will never miss another bill! Breakdown shows you your expense broken down by categories. This helps you gain total picture of where your money is going, so you know where to cut back. Trends visualize your finance using line charts. For example, view the Balance Trend to see if you are getting richer or poorer each month. Compare Expense and Income Trends to ensure you are living with your means. Or compare your Groceries and Dining Trends to see relationship between them. 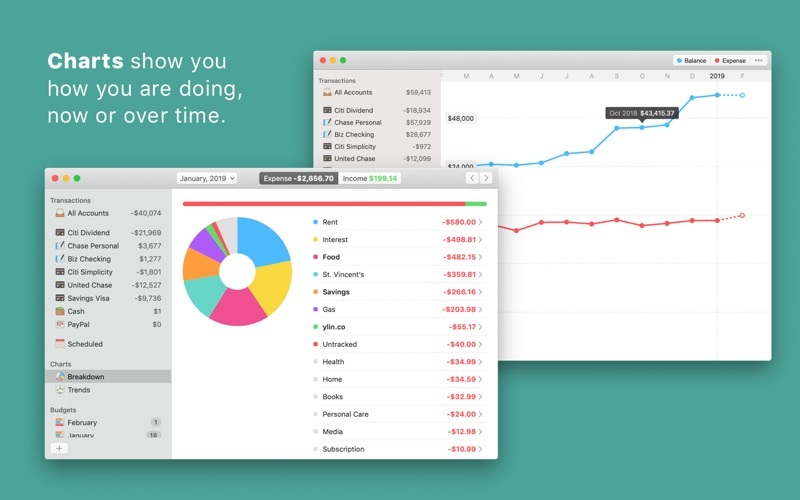 Savings has a simple budgeting system that lets you create a monthly budget. As the month progresses, Savings shows you your progress so you know whether you are spending too fast. 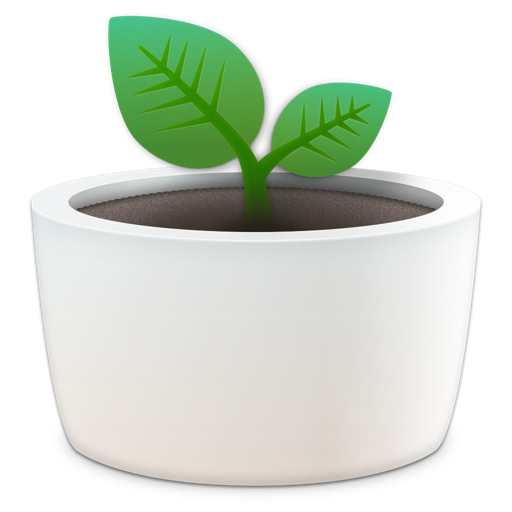 Savings looks great in Dark Mode on macOS Mojave. We have fine tuned every user element for a gorgeous new look. Unlike apps like Mint™ that sell your financial data to advertisers, we believe your financial data is for your eyes only. Savings’ data stay on your computer. When it is sync, it uses Apple’s secure iCloud technology so no one, not even us, can see your data. We believe once you pay for an app, you can use it forever. We will not charge you an annual subscription like Quicken™ or Debit & Credit. We will also keep improving Savings 2 so you get those updates for free. Savings has a full-featured iPhone app. Everything is synced instantly between all your devices. To buy the iPhone app, just search "Savings 2" on the iPhone App Store, or go to savingsapp.com. We believe a personal finance app should be beautiful. That is why we crafted every pixel of Savings with care. Email support@savingsapp.com and we will get back to you right away. 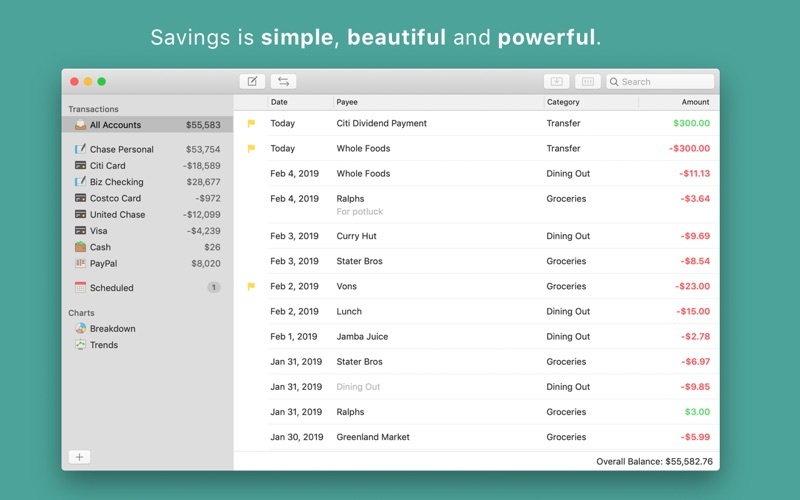 Savings 2.4 introduces Dark Mode. 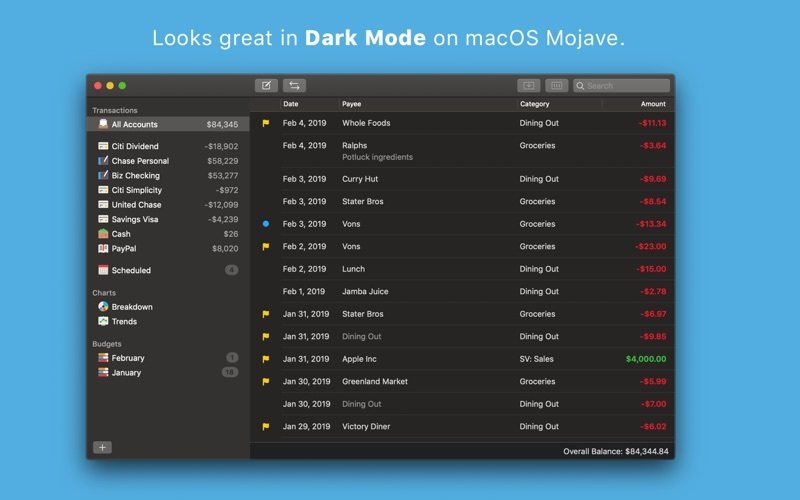 You can now see Savings 2 in its gorgeous dark theme when you switch your Mac to Dark Mode under macOS Mojave. • Fixed a bug where the first budget created isn’t visible until user restarts the app. • Fixed a visual bug where in Scheduled, the group row background is clear instead of gray, making it harder to read. • Remove alert that shows when scheduled transactions are due. This is unnecessary because the notification badge on the Dock icon is sufficient. • Fixed a bug where clicking on the “Other” slice in Breakdown pie chart causes a crash. • Modify budget so a monthly budget is always created by default, instead of yearly. • Fixed a visual glitch where the “iCloud is On/Off” label is not readable in Dark Mode. We work hard for each release of Savings 2. If you enjoy using Savings, please take a time to leave us a review. We really appreciate it! 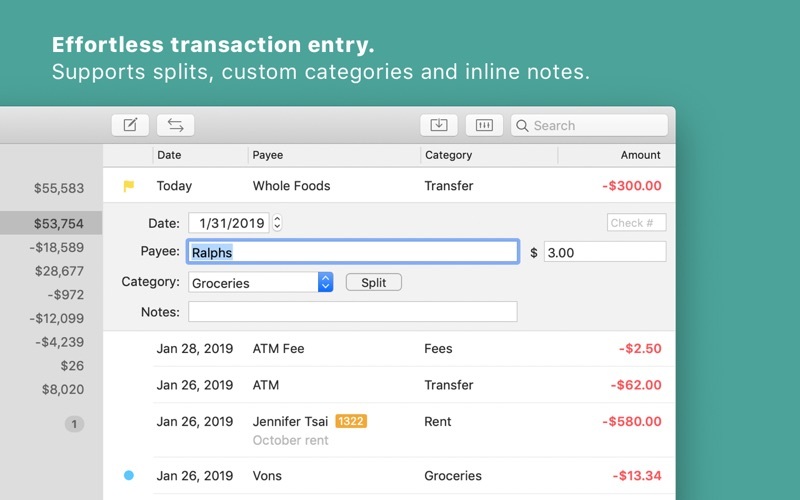 • In Scheduled view, we added color that suggests whether the action is a Pay, Deposit or Transfer to make it more intuitive. • We have re-enabled budget for users who are using this feature. To create a new budget, just choose File > New Budget from the menu. • We fixed many bugs in Savings’ budget that are plaguing some users. Budget should be stable now. Let us know if you run into any issues. • The keyboard shortcut for Running Balance is changed to the more intuitive Control + B. 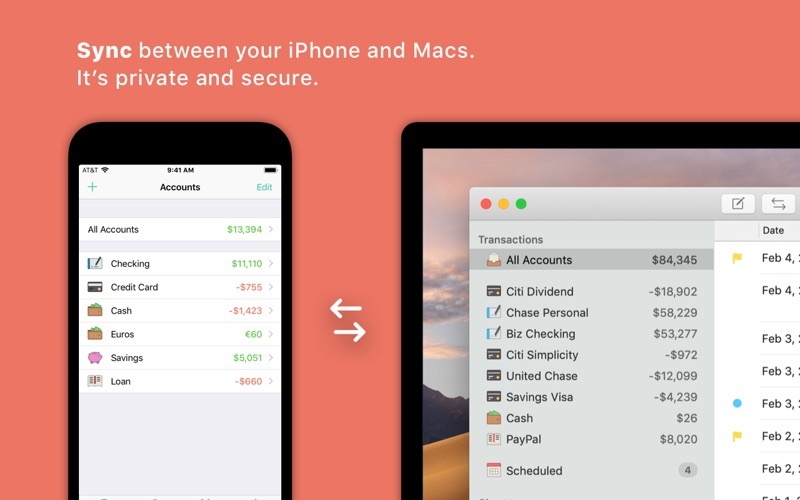 • Retina optimize account balance toggle arrow.